We were approached by David Wilson Homes Yorkshire West to create an advertising campaign for a prestigious new development. 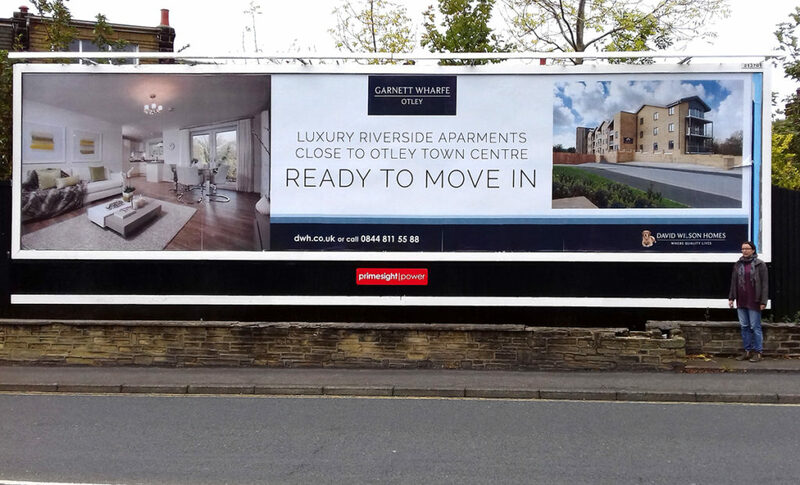 This campaign was to promote a new phase for the new Garnett Wharfe riverside development in Otley. After an initial conversation we agreed the brief. The client needed this campaign to compliment their existing marketing for the development. The purpose was to target professionals who were already working in and around Otley. They wanted to encourage these professionals to not only work locally but to also live locally. They also wanted to tell commuters from nearby Leeds about the development. The purpose here was to show them the benefits of living in this new development in Otley. CG Advertising looked at all of the various outdoor options available. This included bus advertising. However we decided to run a purely billboard campaign because of it’s unique visual impact and specific locations. A series of 48 and 96 sheet billboards were booked around Otley and Leeds over several months. These allowed the client to capture commuters as they travelled to and from work. The quality and location of the new apartments provided a series of fantastic visual images. These allowed the client to show the apartments in the strongest light. By using sharp photography and simple images, the whole campaign created a strong image and allowed us to portray a specific lifestyle. The campaign had the desired effect. The billboards created both interest and desirability amongst the target market. This then lead to an increased number of enquiries for the development. This in turn meant that the new phase of the development quickly sold out. Enquiry Please enter a message.